On the couple of days a week that I work out of the house all day, I often stop at the grocery store on my lunch break, in search of something new to try to eat. You never know what you may stumble upon or what may catch your eye. 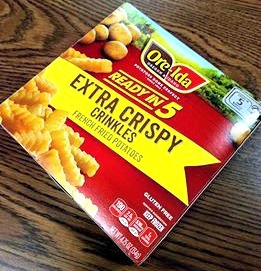 Today I saw Ore Ida Extra Crispy Crinkles, which are fries that you can make in the microwave. For $1.50ish, I figured why not? The weather supposedly is getting warmer and sunnier (though you wouldn’t quite yet know it here in Upstate NY). It’s making us dream of warmer weather and I am always dreaming of a luscious cup of coffee. So in this giveaway you can combine the best of both worlds when you sample and try to win Hawaiian coffee from Java Factory. 2 Winners ~ $50 TRV! While we’d love to, we can’t send you to Hawaii but we can send TWO lucky readers a 40 count box of Java Factory Flyin’ Hawaiian Coffee to bring some of the flavor of Hawaii to them. Pre-Order This Limited Edition Coffee on Amazon! It’s time to stock up on cocktail umbrellas. Rich Kona coffee blended with notes of macadamia nut and vanilla bring the spirit of aloha to you. Just queue up the ukulele tunes and relax for a Hawaiian getaway at home. This giveaway is in no way endorsed, affiliated, or associated with Facebook, Twitter or any other Social Media Networking Site. You are not eligible if you have won a prize from the sponsor in the last 90 days. This giveaway is valid in the United States only and entrants must be 18+ years of age to enter. This giveaway event will end at 11:59 PM (EST) 6/5/17. The winners will have 24 hours to email their information back to paula_stewart at ymail dot com or a new winner will be drawn, you may want to put this email address as safe as it could go to spam. The sponsor is responsible for shipping of the above prizes. No blog associated with this contests is responsible for prize fulfillment. If you take an entry you must stay following for the entire contest or you will be disqualified.